This post intends to give an overview of CELTA assignment 2 and what is expected. It uses a generic example to work through answers so please be aware that not all centres would give exactly the same question but there should be many similarities. After reading this article, you should have a clear idea of how best to answer the points in this assignment. Please refer to your centre or tutors in case of any doubts about the points made in this article if they are different to what you have been told on your course. As a rule, always go with what they say as they are the ones who are going to mark your work! One a further point to note is that links in this article are affiliate links. This means no difference in price to you but clicking through these links means a small commission for CELTA Helper to keep the site running. If you do not wish to use these links, you can easily find the books online. This assignment usually comes after the Focus on the Learner assignment. The key to completing this ‘Language Related Tasks’ assignment successfully is by thinking about it as if you were preparing to teach the points that come up. If you write with students in mind, you will stay focused on the task and should have clear and precise answers as a result. For CELTA Assignment 2, you will need to focus on language skills and awareness. To complete this assignment, you will likely be given a short text with examples of language to analyse. The texts shown in example versions of this assignment which are available online are often from pre-intermediate or elementary coursebooks. These extracts focus on simple parts of grammar and vocabulary. However, you will still need to explain these points clearly and succinctly to get a good score on this assignment! This might seem like a lot of words, but answering all of the points for all of the questions needs this amount of words! My advice is to focus on answering each question thoroughly and systematically and not to worry about the words until the end. Make sure you answer each part in enough detail and it will be fine. However, if you often write too much, think of it as 4 different sections, with no more than 250 words per sectiswon. Counting words per section should therefore help you to stay on task. With this in mind, you will therefore need to focus on correct identification and analysis of the language items you select. These books, among others, can also be used as references in your assignment, which you have to include, as stated above. You can place references to these books at the end of the document, or perhaps at the end of a relevant section. Ask your tutors for their preferred way to do this. For help with referencing, see the relevant section in a previous post to help you save time on your CELTA assignments. The last thing to think about is using clear, concise language. You can write in short sentences for this assignment, which are often clearest for the reader. Now that you have an idea of what you need to produce, let’s look at how to answer the questions for the language related tasks assignment. Let’s deal with each of these points using two examples, first for a point of grammar, and then for a point of lexis. The meaning answer needs to show a clear understanding of the key grammar point. e.g. “In this example, “‘s just been” is used to show a recently completed past action. One sentence should be fine here. Just make sure you summarise the main point of grammar and you will be fine! This structure is called the present perfect (simple) tense. The verb ‘have’ is always needed as an auxiliary verb for this tense. ‘has’ is the 3rd person singular form of the auxiliary verb for the subject ‘She’. It is then followed by a past participle of the relevant verb, which is ‘been’ in the example sentence. This is then followed by the preposition ‘to’ to describe the place visited. The contracted form of the ‘has’ is ”s’, which is common in spoken English. The word ‘just’ here shows that it is a recently completed action in the past. It’s unlikely you would have enough words available to write all of the sentences above for one point, but it gives you an idea of how to do it. And that’s all for the meaning section! You do not have to write the pronunciation using phonemic transcriptions but you should get extra marks for using this correctly. You might only need to transcribe the relevant parts of the present perfect tense – check with your tutor! You can also copy and paste individual words from the Cambridge online dictionary, if you like. You could show the stressed words above the sentence as big circles and little cirlces (as I have done below), or as arrows/a line which shows upward and movement with the stress – hard to do on here but hopefully you get the idea! This is simply when we connect words in a sentence when speaking and pronounce them slightly differently to when they are said on their own. You can see that ‘to’ in the sentence uses a schwa (/ə/) and is pronounced as /tə/. By contrast, if saying ‘to’ on its own in an English lesson, or perhaps for emphasis, we would say it more like /tu:/. Try to be aware of these small differences when planing a lesson as well! So if we look back at our example sentence She’s been to the shop, we can see it has a contraction (the apostrophe before the ‘s’) so we know it’s not appropriate for formal written language. This is because all words should be written in full. This sentence is informal and would likely be used in spoken English only as it has a contracted form. You only have to consider this where relevant – it should be clear when/where this is the case. You should give a clear solution for each problem you identify. Concept checking questions (CCQs) are also very helpful here. You can find examples of CCQs in Scrivener’s Teaching English Grammar book for each relevant grammar point. All that is left for you to do is adapt the example CCQs in Scrivener’s book slightly and make them relevant for your assignment. You can then also add this book to your reference list, showing that you’ve done reading and that you’ve got your ideas from a reliable source. Win win. Problem: Students might not understand that this person has recently ‘been to the shop’. 1. Question: Did she go to the shop today? 2. Question: Is she at the shop now? 3. Question: When did she come back from the shop? There are many ways you could approach this – it depends what you want the students to get from it (think lesson aims/objectives here) but you should be able to ask 1-2 clear CCQs to get the students to focus on what you want. Problem: With the contraction, students might not realise that the apostrophe ‘s’ + been shows that this must be a present perfect sentence and is short for ‘has’ (this is because ‘She is been’ is not grammatically possible). 2. Question: How do you know it is ‘has’? Answer: because there is ‘been’ / a past participle after it / it is the present perfect tense / etc. Solution: Perform drilling with students when the sentence is on the board. Start with choral drilling, then choose paris/individuals, then back to choral drilling. Remind students that this should always be pronounced as it is written. Problem: Students might think that they can use this contracted form in writing. 2. Question: (continued from Q1 above) Yes or no: when you are writing (hint – in an exam/test)? Then explain that all words should be written in full – for speaking it is fine to shorten them with contractions. Now, from the above, I have not used any reference materials directly. However, you will need to include references whenever you use them. This is not as big of a problem as you might think. For example, if you are using APA style referencing (which is quite common), you simply need to enter the author’s surname and year of publication after the point you have paraphrased from their work i.e. (Harmer, 2012). At the end of the section, put a heading like ‘Reference list’ (APA style). You can see more on how to do it, check my article on time-saving for CELTA assignments here. And that’s it for the grammar item! From there, let’s move on to the example lexis item for analysis. This sounds a little awkward but as you can probably see, it is quite hard to describe ‘prevent’ succinctly without using the word itself! This is a common problem in ELT so try to get used to explaining things like this succinctly and clearly. “‘Prevent’ is the infinitive verb form. If you are not sure about transitive/intransitive verbs, all good (online) dictionaries should display this – I recommend Cambridge dictionary for the CELTA course for this reason. 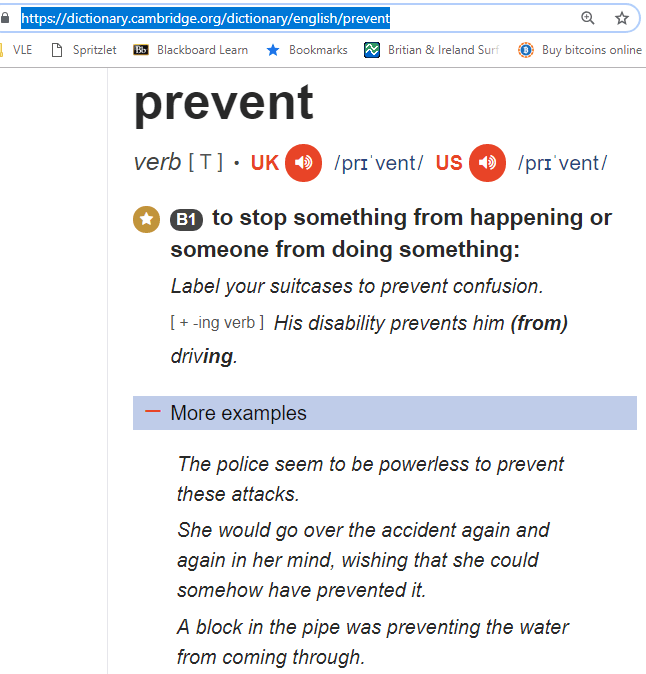 See the ‘[T]’ in the screenshot below from the entry for the word ‘prevent’; this shows that it is a transitive verb. The second syllable is stressed. That should be fine here! NB – ‘Part 3’ for connected speech is likely not relevant here so has been skipped. However, if you think it is relevant, in that the given word is likely to be pronounced in a connected way, then cover it in the same way as we did in the grammar point. If not skip it in your assignment, too. As it states that this is only needed where relevant in the examples of this task online, you could probably skip this section. The only point of note might be that it is acceptable as a formal/academic word. Even so, that would only really be worth including if you are struggling to find other things to write about in the other sections of this lexis answer. As such, let’s save our word count and move on to the next section. There will likely be fewer aspects to cover here than in the grammar section, but you will still need to be thorough. Problem: Students may not realise this focuses on doing something before an event. It is unlikely that there will be an issue with the form here because this is an infinitive. You don’t have to answer every aspect so you could probably skip this section for this example. NB – you will probably be given an adjective, noun or adverb as these will likely have more depth in terms of teaching than a regular verb. If you are given a verb then it would likely be an irregular verb. Because there wasn’t an obvious problem/solution for the form section above, you can make up for that by including 2 x pronunciation issues here. Problem 1: Students might pronounce the first syllable as a long vowel sound as with words like ‘pre-sessional’ or ‘preach’ (this syllable would be transcribed phonetically as /pri:/). You could also use the phonetic transcription here if you think the students will know it. If you are not sure, don’t use it. Teaching students the correct stress should avoid (or ‘prevent’!) this problem. Problem 2: Students might struggle to pronounce the ‘t’ (or /t/) at the end and simply leave it silent. Solution: Take in a printed copy of the phonemic chart and point to each sound when working through it. Write the transcription on the board below the word and tap on /t/ if difficulty. This /t/ sound could be practised through drilling on its own to confirm the importance of it. The above should be enough for your problems and solutions. And that’s all for your lexis item for analysis, and for your analysis in general! Once broken down, it’s not as difficult as it first seems. Just be thorough and remember it will take longer than you think so don’t leave this until close to the deadline! Here are some examples of CELTA assignment 2 available for free online. Before you look at them please note that they do not often show the grade received and they vary in quality. Some websites might also ask you to sign up or sign in, or even pay for downloading them. This is up to you but all these links will show you at least a part of the assignment to give you a clearer idea of how it looks. From ISE Hove CELTA centre: http://www.isehove.com/userfiles/file/11_%20&%2012_%20Language%20Related%20Assignment%20(new).doc (this is a template file with questions only). You will see that they vary greatly but have similar types of questions to complete. Remember that you can be far more creative than the ‘solutions’ suggested above in my worked examples. Things like pictures, gestures, mimes, timelines and physical objects can all help to explain a point clearly and easily. If you follow all of the above points, you should be fine when completing the ‘language related tasks’ in this assignment! One general piece of advice is to always keep your tutors happy. Some of what they tell you to do may feel wrong at times at times but you will get through the course with less stress and resistance by following their advice. And you will likely get a better grade. Finding A Job After The CELTA – How Easy Is It And How Long Does It Take? CELTA Concept Checking Questions (CCQs): What, Why and How?